The OptaJoke Podcast is dead, long live We Are Going Up! If you’ve stumbled across this website looking for the OptaJoke Podcast, you’re a bit late – after an unprecedented success during the 2010/11 season, the OptaJoke Podcast has decided to move on and develop into a new venture…this time focusing on the Football League to give all the teams outside of the Premier League a voice. We’ve recruited a blogger for all 72 league clubs and each week we will bring you a podcast with all the big news, views and analysis from the guys you got to know last season. So please come and check out are fully working website (no more WordPress for us!) at this link. Of course, feel free to browse this site to enjoy some of the nostalgia the OptaJoke Podcast brought you, including the much-loved 20 Questions Game. You can also follow We Are Going Up on Twitter here. Here’s to the new season! After 50 podcasts, 139 blog posts, and 1000s of you discovering us, The OptaJoke Podcast has finished for the season. Thanks to everyone who has listened to the pod, read the blog and got in touch via Twitter, Facebook and iTunes during the season! At the beginning of July we will be launching an exciting NEW project, that we believe can bridge a gap in the football podcast market, along with a fresh new website to accompany it. Without giving too much away, if you want to write about your club – be it West Ham United or Crawley Town, drop us a line at optajoke@gmail.com. The original OptaJoke Twitter account (parodying OptaJoe) will still continue, but will run completely separately from our new project. In Pod 50, the final show, the lads acclaim the newly crowned kings of Europe Barcelona – and talk play-off joy for Swansea, Peterborough and Stevenage… plus we play the final round of 20 Questions! Thanks for listening this season, have a great summer and watch this space for an exciting new project from us in July! As May draws to a close the football season comes to an end. While it doesn’t seem so long ago since teams were kicking off basking in warm August sunshine another campaign has passed. While you’re possibly celebrating the fact your side has won a trophy or will find themselves playing at a higher level next year there’ll be plenty of fans who are coming to terms with relegation or disappointed at mid-table mediocrity. Plenty has gone on during 2010/11 and this week I’m picking out some of the best moments for my final top 10 countdown of the season, packed with goals, drama, individual skill and great football. Enjoy. May 14th 2011 will go down as a memorable day for Manchester’s two football teams. At lunchtime United won a record 19th domestic championship with a 1-1 draw away to Blackburn Rovers while later in the day City won their first trophy after 35 years of trying, defeating Stoke City 1-0 in the FA Cup Final at Wembley. United’s success saw them ‘knock Liverpool off their perch’ as Sir Alex Ferguson famously said, overtaking their record of 18 league titles. Having gone 1-0 down to struggling Rovers, United fought back in the second half and won a penalty when Javier Hernandez was felled by Paul Robinson. Wayne Rooney stepped up in front of the expectant away following and he delievered, slotting the penalty home and with it writing United into the history books. Meanwhile at Wembley City were looking to make history of their own by clinching the FA Cup. Not since their League Cup victory there in 1976 have they collected any silverware – in the meantime they’ve had to witness their city rivals win a whole host of European and domestic trophies. Armed with a bottomless pit of money, the Citizens now had a team which could challenge at the business end of the season and it was their class which prevailed against Stoke. With the game at 0-0 and less than twenty minutes remaining, the ball broke for Yaya Toure just inside the penalty area and he made no mistake, belting a shot past Thomas Sorensen to the delight of the Mancunian support. City held out to win the cup and they’ll be looking to add many more to it during the next few years. Tottenham Hotspur provided great entertainment during their debut Champions League campaign. Harry Redknapp’s men came through the qualifiers and into a group alongside FC Twente, Werder Bremen and holders Inter Milan. When facing the Italians away in October, Spurs were down to ten men within ten minutes after goalkeeper Heurelho Gomes was sent off, the resulting penalty was converted and it went from bad to worse as the Londoners found themselves 4-0 down at half-time. Step forward Gareth Bale. After an indifferent start to his career at White Hart Lane, the 21-year-old Welshman established himself in the side last season and began 2010/11 in blistering form. He inspired an improbable comeback in the second half, tearing right-back Maicon to shreds with his running and scoring a hat-trick. All three goals were scored from a similar position, from the left hand side of the penalty area. His first came after a 50 yard run down the left and clinical strike across Julio Cesar into the bottom corner. It remained 4-1 until the last two minutes as Bale struck again, this time leaving Javier Zanetti trailing and scored a near identical second goal. A minute later the comeback was nearly complete as Bale rifled in his third but eventually time ran out on Tottenham and they had to settle for a 4-3 defeat. Bale put in another outstanding performance in the return game weeks later as Tottenham won 3-1 at home. It was a phrase so often used to describe the Tangerines but a very true one. Ian Holloway’s Blackpool arrived in the Premier League via the Championship playoffs and were instantly written off as no-hopers. A squad with players who’d mainly plyed their trade in the second tier or lower and a club struggling to even bring players in during pre-season made many people believe they would go down as the Premier League’s worst ever team. Blackpool silenced the doubters initially on day 1 of the season, winning 4-1 at Wigan Athletic before going down 6-0 at Arsenal a week later. An impressive 2-1 win at Newcastle put them 4th after 4 games and in early October they pulled off an even better win, beating Liverpool 2-1 at Anfield. Scottish midfielder Charlie Adam was living up to his captain’s role with some outstanding performances and Ian Holloway’s side were entertaining, playing open attacking football. The manager was entertaining too, his brilliant reaction to the Wayne Rooney saga a highlight. 11th at the turn of the year, the Seasiders looked on course to avoid relegation but form soon deserted them. Whilst they stuck to their attacking principles, their defending let them down as they surrendered leads and dropped down the table. As the season drew to a close they earned a credible draw at Tottenham and beat Bolton 4-3 in a pulsating match, the last of the season at Bloomfield Road. On the final day they equalised and then went in front against Manchester United at Old Trafford, only to lose 4-2 and with it their Premier League adventure was over. Blackpool came into the Premier League with a fresh approach rarely seen by promoted sides. Rather than shut up shop and defend they took games to their more illustrious opponents, matching them with attractive passing football. The likes of Charlie Adam, DJ Campbell, Gary Taylor-Fletcher and David Vaughan made the step up to Premier League football and came so very close to keeping the club up. Most neutrals will feel the league is a poorer place without them. Jose Mourinho was appointed Real Madrid coach in the summer of 2010 charged with the task of knocking Barcelona off their perch, hoping to end the Catalan side’s dominance domestically and in Europe. The two great rivals met several times this season but it’s the first encounter we’re focusing on, a La Liga game at the Nou Camp in November. Months earlier Mourinho’s Inter Milan team knocked Barcelona out of the Champions League, a moment the Special One celebrated by sprinting onto the turf at the final whistle. However it was an unhappy return this time for Jose as his side were taken to the cleaners, Pep Guardiola’s team handing out a 5-0 thrashing with goals from Xavi, Pedro, Jeffren and two from David Villa. Boasting some of the world’s finest players capable of producing scintillating football, Barca are arguably the best club side around and this match proved why. The rise of AFC Wimbledon is an incredible story. The club were founded in 2002 after the FA sanctioned the move of Wimbledon FC to Milton Keynes and disgruntled fans, believing the MK Dons no longer represented Wimbledon’s legacy, decided to re-establish their football club from scratch. Holding trials on Wimbledon Common, the club got together a team, coaching staff, a ground and began playing in the Premier Division of the Combined Counties League. Since then they have been promoted five times in eight seasons, going 78 league games unbeaten at one point – a record for English senior football. In 2009-10 their first season in the Blue Square Premier saw them finish 8th and this season they finished 2nd behind runaway champions Crawley Town, entering the play-offs. They hammered Fleetwood Town 8-1 over two legs to meet Luton Town in the final at Manchester City’s Eastlands stadium. The game was a tense affair with a disallowed goal and both sides hitting the woodwork but the scores remained 0-0 after extra-time and the game went to penalties. Top scorer Danny Kedwell smashed home the winning spot kick for the Dons after goalkeeper Seb Brown saved two Luton penalties, Wimbledon fans and players were overjoyed at the final whistle as they completed a fantastic journey from the lower reaches of non-league to the Football League in just nine seasons. Wimbledon FC were promoted to the league in 1977 and by 1986 were a top-flight team, could history be repeating itself? Who says the Carling Cup is meaningless nowadays? This season’s final saw Arsenal, in the hunt for their first trophy since 2005, face Birmingham City, looking for their first major cup win since lifting the League Cup in 1963. Birmingham were considered underdogs and the match was billed as a perfect opportunity for Arsene Wenger and his young side to finally claim a piece of silverware. Birmingham took the lead on 28 minutes, Roger Johnson flicking a corner onto the head of Nicola Zigic, who nodded the ball past Wojciech Sczcesny. 11 minutes later Arsenal were level, Jack Wilshere’s shot hitting the bar and soon after Robin van Persie volleyed Andriy Arshavin’s cross acrobatically into the bottom corner. The scores remained 1-1 until the 89th minute. A long ball from Blues goalie Ben Foster was nodded on by Zigic and looked to be heading straight to Sczcesny. However Gunners defender Laurent Koscielny tried to play the ball, causing a mix up with his goalkeeper and the ball to bobble to Birmingham substitute Obafemi Martins, who rolled it into an empty net. There was not enough time for Arsenal to get a goal back and Birmingham held on to win the trophy and with it a place in the Europa League next season. Unfortunately for them their league form went downhill after this match and they ultimately were relegated to the Championship on the last day of the season. Norwich City have had a remarkable 2 years. Relegated to League One in 2009, their first game back in the third tier since 1960 ended in a 7-1 home reversal at the hands of Colchester United, managed by former Celtic and Borussia Dortmund player Paul Lambert. Canaries boss Bryan Gunn was ousted six days after that thrashing with Lambert taking the job. The Scot oversaw an upturn in fortunes and led his side to an immediate return to the Championship by winning the league, going 16 games unbeaten (with 14 wins) at one stage of the season. Captain Grant Holt netted 30 times during the promotion campaign and continued his goalscoring form in the second tier as Norwich adapted to Championship football comfortably. Lambert kept together the nucleus of the side so successful the season before and brought in the likes of Simeon Jackson, Andrew Surman, John Ruddy and David Fox to add to the squad. The Canaries were consistantly in the top 6 throughout the season and in the closing weeks of the season embarked on a run of form which saw them into the top 2, including demolishing great rivals Ipswich Town 5-1 at Portman Road. Grant Holt hit 21 goals in the league and Simeon Jackson, after a slow start to his Norwich career, found his scoring boots and netted the only goal of a 1-0 victory at Portsmouth in the penultimate game of the season – the goal that sealed Norwich’s return to the Premier League after six seasons away. Canaries fans celebrated wildly at the final whistle as did Lambert and his coaching staff, Norwich becoming the first side since Manchester City in 2000 to complete back-to-back promotions into the top flight. In early February Arsenal were flying – sat second in the league with aspirations of winning the FA Cup, Champions League, League Cup and Premiership to boot. They travelled to St. James’ Park to face Newcastle, the hosts mid-table after adapting quickly to life back in the Premier League. Arsenal got off to a flier, Theo Walcott netting after just 44 seconds then Johan Djourou and Robin van Persie made it 3-0 to the visitors after 10 minutes. Van Persie then nodded home a fourth for the Gunners on 26 minutes as some furious home fans began exiting the stadium – they would regret doing so. In the second half Arsenal midfielder Abou Diaby saw red for pushing Joey Barton and Kevin Nolan but with less than 25 minutes to go the score was still 4-0. Newcastle won a penalty in the 68th minute which was netted by Barton, Leon Best had a goal disallowed for the Toon before scoring from close range after getting the better of Gael Clichy. The Newcastle fans who’d chosen to stay were now willing their team on passionately and Alan Pardew’s side made it 4-3 – Barton converting a second penalty after Laurent Koscielny was adjudged to have fouled Mike Williamson when challenging for an aerial ball. Mounting pressure from the home side eventually proved too much for Arsenal and after they failed to clear a free-kick, the ball fell to Cheik Tiote and he smashed a 20 yard volley past Wojciech Sczcesny to complete an amazing comeback and send St. James’ Park into raptures. One of the games of the season without question. It was the final the world wanted to see, Europe’s premier club competition being fought out between Manchester United and Barcelona. Wembley hosted the game for the first time in 19 years and prior to kick-off looked as if it was built for such occasions. The game was a great spectacle, after a bright start from Sir Alex Ferguson’s men it was Barcelona who began to take hold and got their reward as Pedro collected Xavi’s excellent outside of the foot pass and clinically stuck it past Edwin van der Sar for 1-0. On 34 minutes though United were level, Wayne Rooney finishing off a fine move with applom, rifling a shot high beyond Victor Valdes. Barcelona were favourites prior to the game and in the second half began to show their class as Messi, Xavi and Iniesta dictated matters. Messi got his first goal on English soil ten minutes after the restart, his 53rd strike of an amazing season for the Argentine. Pep Guardiola’s side continued to dominate and Manchester United could not keep the ball for very long, Barca’s pressing game paying off. Fifteen minutes later Barcelona netted a third, David Villa curling the ball home 20 yards from goal, an outstanding strike which capped off a memorable evening for the Catalan side. This was their fourth win in the competition and few would bet against them adding to it in the near future. With the title race wrapped up the weekend before, attention turned to the bottom of the Premier League for it’s final day and it did not disappoint. Five teams were fighting to remain in the top flight, hoping to not be one of the two sides accompanying already-relegated West Ham into the Championship. Blackburn (40 points,) Wolves (40 pts) and Birmingham (39 pts) sat outside the drop zone while Blackpool and Wigan (both on 39 pts) were in the bottom two on goal difference. Blackburn were away at Wolves with the winners guaranteeing survival and it was the visitors who had the better of the first half, storming into a 3-0 lead. Blackpool went behind to Manchester United at Old Trafford before equalising through Charlie Adam’s set-piece potency as he fired home a free-kick from 25 yards. Birmingham and Wigan were drawing 0-0 at Tottenham Hotspur and Stoke City respectively so at half-time it was Blackburn, Blackpool and Birmingham who were on course to stay up. In the second-half Spurs went in front over Birmingham while Blackpool took the lead against the Champions but were soon pegged back. Jamie O’Hara’s strike at Molineux made it 3-1 but despite goal difference being so tight it did not make a difference. Within five minutes things began looking ominous for Wolves as Wigan took the lead at Stoke with Hugo Rodallega’s header and Birmingham equalised at White Hart Lane through Craig Gardner. Blackpool began to crumble as Ian Evatt’s own goal and Michael Owen’s cool finish saw them go 4-2 down. With nerves jangling at grounds round the country, fans were listening to radios and monitoring phones to keep tabs on events, none more so than at Molineux where Wolves needed a goal to haul themselves out of the bottom three on goals scored. With four minutes of normal time to go they got that goal and it was a peach. Wayne Hennessey’s long kick was flicked on by Steven Fletcher to Stephen Hunt and the Irishman cut in from the right and curled an effort into the far top corner of the net as Wolves fans celebrated salvation wildly. A goal at White Hart Lane could still change things though – when it came it spelled the end for Birmingham as Roman Pavulychenko’s rasping drive flew in off the bar to seal a 2-1 win for the hosts. The scores around the grounds remained the same as Wigan won back-to-back games for the first time in two years to ensure survival, Blackburn and Wolves celebrated their safety as Birmingham and Blackpool were relegated. A great day for the neutral but a sheer rollercoaster for followers of the teams involved. So that was 2010/11. It hardly seems that long ago since the World Cup but already another football season has been and gone. There’s been some brilliant goals, upsets, great comebacks and fine entertainment throughout. As we now face a couple of weeks without football we can look back on nine months which gave us deserving European Champions, underdogs winning trophies, Ian Holloway’s colourful press conferences and a final Premier League matchday to remember. I’m looking forward to next season already. After another dramatic final day to the Premier League season we now know the teams who will remain in the top flight and those who are facing Championship football next season. Five teams were in the mix to occupy the final two relegation spots alongside West Ham United and after 90 minutes of twists and turns, what seemed like 300 different league tables posted and frayed nerves of fans all over the country, it was Blackpool and Birmingham City who finished in the bottom three, while Blackburn Rovers, Wolves and especially Wigan Athletic pulled off great escapes of their own. The sheer drama of final day relegation battles encapsulate what it means for fans, coaches and players to stay in the league. The financial rewards are a modern day benefit of remaining a top flight club but also the chance to retain a place amongst the best 20 sides in the country is a reward in itself. This week I take a look at 10 of football’s greatest Houdini acts. Teams written off as relegation fodder who save themselves with runs of form and nerves of steel on dramatic final days of the season – proof that sometimes one team’s pain is another team’s pleasure. After securing promotion to Division One in the summer of 1990, Dave Bassett’s Sheffield United were not given much of a chance of staying up and after a dreadful start to the campaign that belief seemed justified. Their first win came seventeen games in during December but by March they’d clawed themselves out of the drop zone. In the second half of the season they claimed 36 points from 19 games, including winning seven in a row to finish 13th. Had their first half of the season been better they may have secured European football at Bramall Lane. Ron Saunders left Aston Villa as manager in 1982 and surprisingly turned up at arch-rivals Birmingham City soon after. In his first full season at St. Andrews his side became embroiled in a relegation battle and with six games left of the season they were six points adrift of safety, looking odds-on to drop into the Second Division. However City, featuring players such as Mick Harford, Pat Van Den Hauwe and Noel Blake won five of those last six games, including three away victories and defeats over Everton and Tottenham Hotspur to eventually finish three places ahead of the bottom three. Paul Jewell guided Bradford City into the Premier League for the first time in their history in 1999 but were quickly written off and tipped for an immediate return to the Football League. On the final day of the season Bradford were level on points with Wimbledon but found themselves in the relegation zone on goal difference. Wimbledon were away to Southampton while the Bantams hosted Champions League chasing Liverpool. David Wetherall’s header saw Bradford win 1-0 while Wimbledon lost 2-0 and Bradford survived. During a 34-year stint in the top flight, Coventry City became specialists at dramatic relegation escapes but few could’ve been as close as the one in 1997. Going into the final day of the season Coventry were in the bottom three two points away from safety and their last game would be a tough away trip to Tottenham Hotspur. Dion Dublin gave them the perfect start after 12 minutes, heading home Gary McAllister’s cross. Paul Williams made it two before half-time but Spurs pulled a goal back after the break from Paul McVeigh. As Coventry battled away in the second half goalscorer Dublin moved back into defence and veteran goalkeeper Steve Ogrizovic pulled off some superb saves to preserve the Sky Blues’ lead. There was great joy for the travelling faithful as their 2-1 win, coupled with defeats for Middlesbrough and Sunderland, meant Gordon Strachan’s side stayed up by a point. In the summer of 2006 West Ham United shocked the football world by announcing the signings of Argentinian pair Javier Mascherano and Carlos Tevez and it would be the latter who would have a big say in the Hammers’ season. Manager Alan Pardew left the club, Alan Curbishley took over but they were firmly rooted in the bottom three with nine games to go. A daunting run of fixtures lay ahead but they won seven of their last nine, including defeating Arsenal away. On the final day of the season West Ham were away to Champions Manchester United while Wigan Athletic were away to Sheffield United, also fighting to stay in the Premier League but with two games to go were five points clear of the drop. Carlos Tevez scored at Old Trafford to give West Ham the lead while at Bramall Lane Paul Scharner put Wigan in front. Jon Stead levelled matters on 38 minutes but a frantic second half lay in store. As West Ham continued to lead, Wigan went down to ten men after Lee McCulloch was sent off but the Latics went in front from the penalty spot. David Unsworth, the defender who Neil Warnock ironically transferred to their opponents, stepped up and fired the ball past Paddy Kenny to give Wigan a priceless lead. The Blades tried to get an equaliser that would keep them in the Premier League with Danny Webber and Keith Gillespie going close but it was not to be, they lost 2-1 and combined with West Ham’s victory at Old Trafford they would be going down.The Hammers were safe as were Wigan to the delight of Paul Jewell and his coaching staff. The events were overshadowed by a row about the eligibility of Tevez’s transfer to West Ham which led to an out-of-court settlement where the Hammers paid several million pounds in compensation to Sheffield United despite Neil Warnock demanding points be deducted that would relegate West Ham. The first ever Premier League season in 1992-93 offered up a truly great escape by Oldham Athletic. Joe Royle’s side were eight points adrift of safety going into the final month of the season and no one gave them a chance. They needed to win their last three games and hope relegation rivals Crystal Palace or Sheffield United slipped up in theirs. Oldham began the week by beating title-chasing Aston Villa, the victory gifting Manchester United the crown, then beat Liverpool 3-2 at Boundary Park as Palace drew 0-0 at Manchester City to set up a tense final day of the campaign. If Oldham won and Palace lost on the last matchday, the Latics would be safe, sending Palace down. The Eagles did lose heavily, 3-0 at Arsenal while Oldham were playing out a thriller as they hosted Southampton. Despite Matt Le Tissier’s hat-trick, the hosts won 4-3 to preserve their Premier League status on goal difference. The season after this one Fulham finished seventh in the Premier League to qualify for Europe then reached the Europa League final the year after, but things could have been very different. As Fulham struggled to remain a Premier League club in 2008 they appointed Optajoke favourite Roy Hodgson as manager. Even he struggled to halt the slide until the Cottagers beat fellow strugglers Reading away from home (their first away win in 18 months) with five games to go. In their next game they were 2-0 down at half-time away to Manchester City, a result which would’ve sent them down had results not gone their way. However a stirring second-half performance saw them turn the match around with Diomansy Kamara striking a last-minute winner. Victory over another struggling side in Birmingham City left Fulham’s future in their own hands going into the final day. Birmingham were in front in their game while Reading were battering Derby County 4-0 but still Fulham were being held at Portsmouth – then Danny Murphy nodded home Jimmy Bullard’s free kick for 1-0. That’s how it stayed and the Londoners survived on goal difference. Nowadays Everton rarely finish outside of the top 10 under the stewardship of David Moyes, but back in the ’90’s they flirted with relegation on several occasions and were a hair’s breadth away from dropping into the second tier. In 1994 it was a real possibility for a club who’d been a top flight team for nearly 50 years and Champions seven seasons before. Mike Walker left Norwich City in January 1994 to take over from Howard Kendall at Goodison Park but poor form meant that come the final day of the season Everton needed to beat sixth placed Wimbledon at home and hope Southampton, Ipswich and Sheffield United failed to win. A draw would not be enough unless Ipswich were defeated at Blackburn. Everton got off to the worst possible start as they went 2-0 down in the first half but brought it back to 2-1 before half-time. In the 67th minute Welsh middfielder Barry Horne controlled a bouncing ball and from 25 yards hit a long-range volley which cannoned in off the post to send Goodison into raptures. As the match entered the final ten minutes Everton still needed a win to climb out of the drop zone and they went in front as Graham Stuart’s shot from the edge of the area bobbled past Hans Segers and into the bottom corner as the fans went mad. Toffee’s supporters in the stands had portable radios glued to their ears as Sheffield United fell behind at Chelsea – the scores remained the same and Everton survived at the expense of the Blades. Here’s Barry Horne’s strike…. Luton Town travelled to Maine Road in 1983 needing a win to remain a First Division club. Hosts Manchester City would be relegated if they lost but a draw would be enough to keep them up. In the second half Luton went in front through Serbian midfielder Raddy Antic. His excellent volley on the edge of the area beat desperate City defenders’ attempted blocks to find the back of the net. City tried to get the goal that would keep them in the top flight but it eluded them and the Hatters got their win. Manager David Pleat galloped onto the pitch celebrating whilst wearing an ill-fitting beige suit and cream shoes, a ridiculous image etched into the memory of football fans everywhere! In the 2004-05 season West Bromwich Albion made history as they became the first club in the Premier League to stay up having been bottom at Christmas. Baggies legend Bryan Robson was appointed manager in November 2004 with the team 17th in the table, 11 games and no wins later his stint as boss got off to the worst possible start. Gradually they turned things around and a draw against manchester United at Old Trafford on the penultimate matchday of the season saw them prop up the table going into the final day but with a mathematical chance of survival. In fact no team had been relegated come the final day – West Brom, Norwich, Crystal Palace and Southampton all could have gone down. Southampton hosted Manchester United while Norwich and Palace were in the Capital facing Fulham and Charlton respectively and West Brom hosted 16th placed Portsmouth at the Hawthorns on a nerve-jangling afternoon. Norwich ended up going out of the Premier League with a whimper as they were hammered 6-0 and Southampton followed with a 2-1 defeat. At the Valley Dougie Freedman and Andy Johnson’s penalty put Palace 2-1 up having fell behind in the first half, whilst in the West Midlands Albion went 2-0 ahead thanks to Geoff Horsfield and Kieron Richardson. Then in the 82nd minute Jonathan Fortune nodded home a set-piece to equalise for Charlton which sent Crystal Palace into the relegation zone and lifted Albion into 17th place. The final whistle went at The Hawthorns but Palace were still playing, searching for a winning goal. Albion fans and players were desperately listening to radios and mobile phones to monitor events in London and the final whistle there was greeted with wild celebrations from Baggies followers. Fans spilled onto the pitch as their side pulled off an incredible escape. No rundown of great escapes would be complete without mentioning the events that took place at Brunton Park on May 8th 1999. Carlisle United were staring at relegation to the Conference on the last day of the season, a point behind 23rd placed Scarborough. Scarborough’s game ended 1-1 and their fans believed they were safe, however Carlisle had one final sting in the tail. With their game also at 1-1 they were going down but had a corner in injury time. Jimmy Glass, the goalkeeper on loan from Swindon Town, went up for it and after the ball fell to him six yards out, he slammed it into the back of net. Mobbed by his team-mates and jubilant Carlisle fans streaming onto the pitch, Glass kept them up with the last kick of the season. That was the Premier League…what did we learn? Die-hard OptaJoke fans will remember after the very first games of the Premier League season, I wrote a blog entitled “The Premier League is a week old…what have we learnt?”, which jovially looked at the state of the table. Man Utd – They won. They always win. Man City – They spent £700 million pounds on coming third and winning the FA Cup. Next season they’ll spend £950 million and win La Liga, they’re that powerful. Tottenham – The world became obsessed with Gareth Bale, despite Blackpool’s Gary Taylor-Fletcher setting up more than double the number of goals that Bale did. On that basis, Taylor-Fletcher will move to Real Madrid in the summer. Liverpool – David N’Gog stopped scoring goals after the second game of the season. Kenny Dalglish turned up and saved their season. For an added bonus they made a fortune flogging a Spaniard to a Russian and collected a Geordie and a Uruguayan in exchange. It could only happen in the Premier League. Everton – As ever, they were exceptional from February onwards. With that in mind, they’ll be playing in the MLS next season under the name of the Evertonian Toffee Crunchers. Fulham – No one cared what happened to them all season, apart from one Sunday afternoon when Mohammed Al-Fayed unveiled a statue of Michael Jackson outside Craven Cottage. Shamon. Aston Villa – Despite being a team full of promising young British footballers, no one really paid them any attention whatsoever. Finished ninth, amazingly. Sunderland – Steve Bruce got fatter with every passing defeat and injury to his team. He ended the season weighing 27 stone. West Brom – Appeared doomed, and then Woy Hodgson turned up. One great shake of his jowly chin ensured they’d stay up and surpass expectation. Newcastle – Were laughing all the way to the bank when they flogged Andy Carroll for £35 million in January. Unfortunately that money couldn’t bribe enough defenders to allow Shola Ameobi to score a goal. Stoke –Rory Delap’s throw-ins qualified for Europe via the FA Cup. Kenwynne Jones went around heading anything within sight. Tony Pulis continued to look like the Geography teacher who’s having to cover a Year 8 P.E. lesson. Bolton – Kevin Davies went for his 12th consecutive season picking up more bookings than he got goals (I’ve not checked, but that sounds about true). Finished a disappointing fourteenth…if they’d have won their last game, they’d have come ninth. Blackburn – Were taken over by a chicken company and appeared to replace Sam Allardyce with someone with the football management skills of Colonel Sanders. 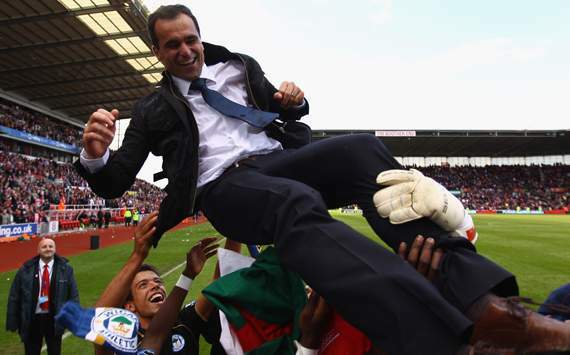 Wigan – Were going to be relegated for 37 weeks of the season, and then snuck out at the very last minute. All 17 of their fans celebrated wildly. Wolves – Truely scraped out of the relegation zone on the last day of the season. Never has a 3-2 home defeat to Blackburn been treated with such joy, and never shall it again. 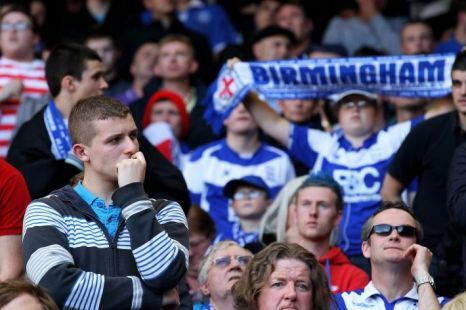 Birmingham – The day before they won the Carling Cup, all their fans said they’d take staying up over winning a trophy…now they’ve been relegated they’re all saying exactly the opposite, of course. Blackpool – Predictably they got relegated, but waited until the last day of the season to confirm their fate. To make matters worse for their suffering fans, it appears they’ll have to play in the Europa League next season. West Ham – Scott Parker was voted the best player of the year by football writers…naturally assuming NO ONE in the league was better, despite the side coming absolute rock bottom. There you have it – one whole season in tasty soundbites. We laughed, we cheered, we called Andy Gray & Richard Keys sexist. And would we do it all again? You bet – see you in August.